Vodka and Canadian bacon set this tomato sauce apart from other spaghetti sauces. 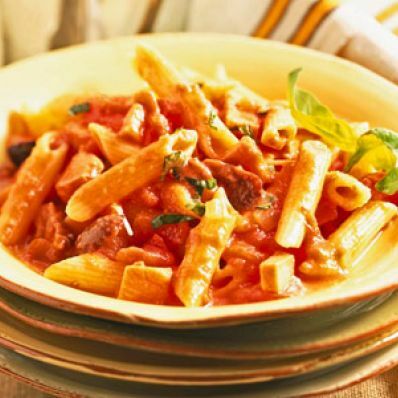 The result is a robustly flavored pasta recipe perfect for winter meals. 1 of 6 Bring large pot of lightly salted water to boiling. 2 of 6 Heat oil in large skillet over medium-high heat. Add onion; cook 10 minutes, until softened, adding water if needed to prevent sticking. Add Canadian bacon and vodka; cook 3 minutes. Reduce heat to medium. 3 of 6 Add pasta to boiling water; cook until al dente, tender yet firm. 4 of 6 Meanwhile, add tomatoes, tomato sauce, olives, sugar, salt and pepper to skillet; cook over medium heat, stirring, 12 minutes. 5 of 6 Drain pasta; transfer to bowl. 6 of 6 Add Parmesan, half-and-half and basil to skillet; heat through. Toss with hot pasta. Serve. Makes 6 servings.